Attending the Canadian Festival Of Spoken Word (CFSW) is a longstanding tradition among Canadian slam poets. The annual festival is held in a different city each year, and for 2018, poets from all over the country gathered in Guelph to compete against one another. They also attended workshops, panels, and showcases designed to help them hone their craft. 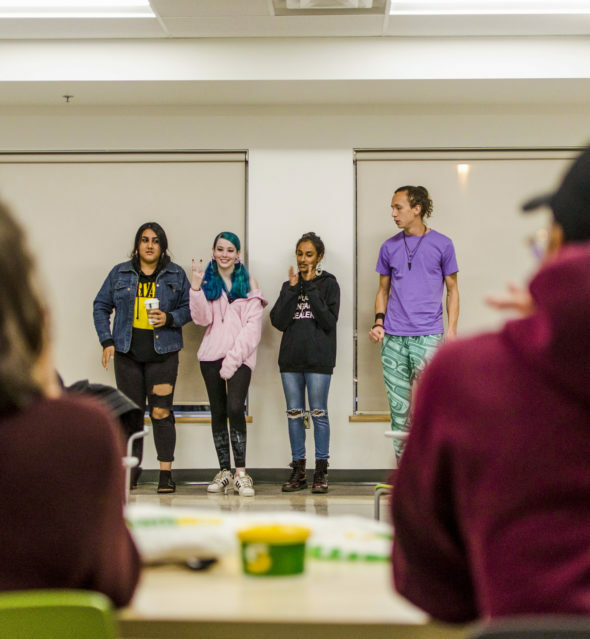 The team sent by the Kwantlen Student Association to represent KPU’s monthly slam competition, Slamapalooza, has four team members: Chelsea Franz, Tawahum Bige, Mariah Negrillo-Soor, and Ainslie Glass. They came in 14th overall—a pretty impressive placement considering that the team didn’t have as much time to prepare for attending the festival as they would have liked. Naaz Sidhu was originally the fourth member of the Slamapalooza team, but was unable to go to Guelph and unfortunately had to step down. A slam competition was held in October to find a fourth member, as teams need at least four poets in order to qualify for CFSW. Mariah Negrillo-Soor won the impromptu competition and joined the team just in the nick of time. “Hopefully next year we can have a team that forms with enough time to practice as much as the Toronto Poetry Slam,” adds Bige. The team from Toronto ultimately won the national competition, and although Slamapalooza wasn’t able to take home first place, they did place higher than the UBC Slam, their local competitors. Franz, Bige, and Negrillo-soor are all students at KPU. Glass, however, is a high school student attending Burnsview Secondary and is only 16 years old. This is not unheard of for Slamapalooza; the team has brought younger individuals along with them before, specifically from Burnsview Secondary. “I’m so grateful to Kwantlen for giving me this opportunity,” she adds. The KSA released $6,400 from their budget so that the four poets could attend the spoken word festival, and so that the team’s coach, Simon Massey, could support them in the competition. The intention behind sending the team to a festival of this calibre is, in part, to create a community between like-minded creatives so that they can share ideas and create new works. KPU’s poets feel that they were able to enjoy this during this year’s Canadian Festival of Spoken Word. Bige also took part in the festival’s Underground Indies, a four-round, head-to-head competition. 24 of the top poets pay $50 to enter, with the winner taking all the money and earning bragging rights. Bige was one of the top six poets of the Indies, making it to the third round. “I am very proud of our team and hope to be a part of this again next year,” he says.